Lily Mariye admitted it was curiosity that led her toward directing. She was in her second of 15 seasons as nurse Lily Jarvik on NBC’s hit television series “ER” when she wondered why some of her castmates were wearing headphones and seated near the director. Mariye has learned the job and is putting her knowledge to good use. Her first directed feature, “Model Minority,” makes its premiere May 11, at the start of the 2012 Los Angeles Asian Pacific Film Festival. 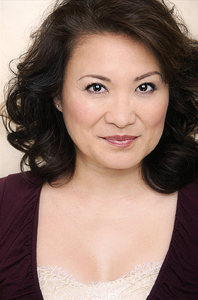 A native of Las Vegas, Mariye first helmed a production in 2000, the award-winning short “The Shangri-la Cafe.” With “ER” having ended its run, she found more time to devote to her latest project, which delves into emotional and psychological problems with groups not normally associated with such maladies. “What happens when you have damage that you don’t talk about and it gets passed on?” was a question she began to examine after seeing a documentary about the social challenges that were faced by Japanese Americans returning from internment camps, and in turn, their children. “After seeing it, I began to wonder about the next generation, the grandchildren,” Mariye said. She looked into studies about Asian American and hapa girls, and saw how many were getting into trouble, in ways not expected of Japanese Americans, a so-called model minority. “Stereotypes are wrong, even if they are positive stereotypes, because they set you up for a fall,” she said. “Model Minority” stars Nichole O’Connor as Kayla Tanaka, in a gritty coming-of-age story of a Japanese American teenager who endangers her promising future as an aspiring artist when she becomes involved with a drug dealer. Kayla and her sister (Courtney Mun) must also face the challenges of coping with and caring for their drug-addicted mother (Jessica Tuck) and alcoholic father, played by Oscar winner Chris Tashima. The film also includes Takayo Fischer, whose credits include “Pirates of the Caribbean: At World’s End,” as the girls’ grandmother. The feature has been a labor of love in more ways that one, Mariye explained, as it was scored by Grammy-nominated saxophonist Boney James–who happens to be her husband. Adding to the joy is the fact that her film will not only make its debut at the LAAPFF, it has been selected as one of the finalists for the festival’s Grand Jury Award in Narrative Feature Filmmaking. She soon took an interest in the creative process behind film production, describing how she would hang around after her shots were done, just to soak up the activity. A turning point came when she was accepted into the American Film Institute’s prestigious Directing Workshop for Women. Mariye said one of the most important lessons taught there was the importance of collaborative effort. After all, she already had a secure gig on “ER,” which made international stars of the likes of George Clooney and Julianna Margulies. “Model Minority” will have its world premiere in the Los Angeles Asian Pacific Film Festival, May 11 at CGV Cinemas, 621 S. Western Ave. in Los Angeles. An encore presentation at the same theater will be on May 15. For more information, visit asianfilmfestla.org/2012/.